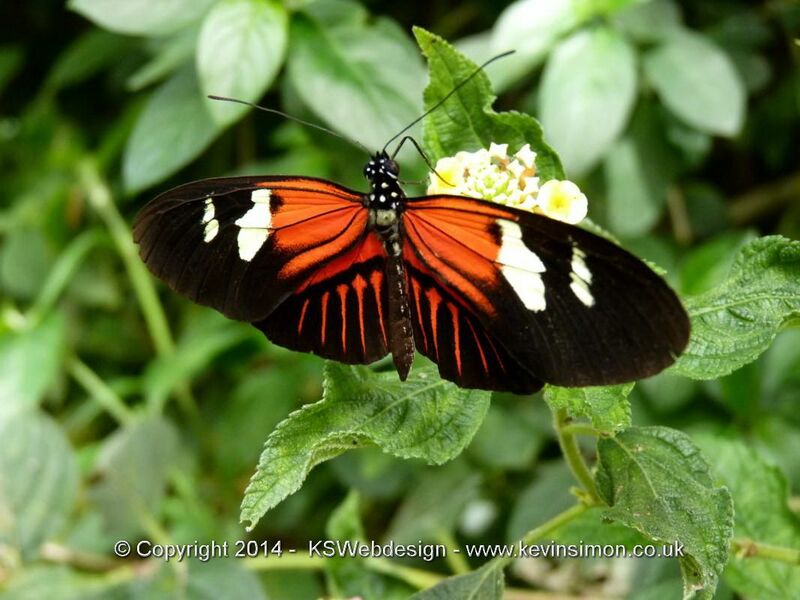 We recently had a visit to Stratford-upon-avon and I decided to go round the butterfly farm. My daughter had been before but myself and partner hadn’t s thought It would make a nice family visit so here is my quick review of the place. I always thought the butterfly farm was just outside of Stratford and was surprised when just by the long stay car Parks by the river and children’s play area, this is a pay and display car park prices were reasonable. Entry price to the butterfly farm are very reasonable at Adults 6.25, Children 5.25 and a family ticket 18.50 , though I had noticed if you have days out vouchers using the Tesco clubcard exchange (see HERE for details) you can use these against the entry price, so I used a 10 voucher against the price so only cost 7.75 for the 3 of us. For full details of opening times see official website HERE. You enter through the garden, then walk way has lovely arches to go through on the path, one with a really nice statue of a fairy, the garden has seating, also a small wildlife pond. The gardens are sent out really nice with nice plants and flowers. Entry to the butterfly house is through the giftshop. As you first go in it is a amazing sight of all the butterfly just flying around, the plants, flowers etc are beautiful. The day that we went there were several school trips so was bit busy, but there is a lot of space to walk around so didn’t really make that much difference. As you walk around there are so many different types of butterflies, now I don’t know that much about the different species of butterflys, but around there is various info boards telling you about them. There are some very large ones which is amazing to see, as didn’t realize butterflies could get this big and the colours on some of them are gorgeous with so much variation of colour on each butterfly. Also inside there is a reptile house with various snakes, spiders, stick insects etc, this part was interesting though myself I’m not into repltiles, the butterflies were more interesting to me. The one thing I didn’t realize is that they eat each other as there was a dead putter fly on a rock and another one looked like it was eating it, and there was another fatherly that scared that one of then had a go itself. This was early interesting to see. There are so many walk ways to go around with all different plants and flowers that attract different type of butterfly, so it is worth taking your time to look around though every step you the there are other many flying around it makes a amazing sight. There are also some lovely water features. While walking around I did only see a few caterpillars. Some of the butterfly do land on you, I had some on my shirt and some did land on my hands the same with my daughter, but non really wanted to land on my partner, so not sure if was because of the smell of her perfume etc. Tough when we did go back in and just sat down to relax and enjoy the sight one did land straight on her nose, unfortunately I couldn’t get the camera out in time, so didn’t get a photo which was a pity. We spent around 2hrs in total around the butterfly farm, as do remember your ticket is valid all day, so you can go away and go round the town and come back in, this is great as can get hot in there. We really did enjoy the visit to the butterfly farm and was well worth the entry price. As the whole place is lovely and relaxing and the butterflies are gorgeous, so if you are just on a day trip around Shakespeare’s Stratford upon Avon it is worth having a look around. I would love to go again a people reading this know I’m into my photography and would like to get some better photos I had took with more macro lens photography, though the photos I took are great see some of them below.